Customer: Hello, can you please take my order? Operator : Can I have your multi purpose Aadhar number first, Sir? Operator : OK... you're... Mr Singh and you're calling from 17 Jalan Kayu. Your home number is40942366, your office 76452302 and your mobile is 0142662566. You are calling from you home number now. Customer: (Astonished) How did you get all my phone numbers? Operator : We are connected to the system, Sir. Operator : That's not a good idea Sir. Operator : According to your medical records, you have high blood pressure and even higher cholesterol level, sir. Customer: What?... What do you recommend then? Operator : Try our Low Fat Hokkien Mee Pizza. You'll like it. Customer: How do you know for sure? Can legal notices be deployed to prevent a publication from coming out with an article? 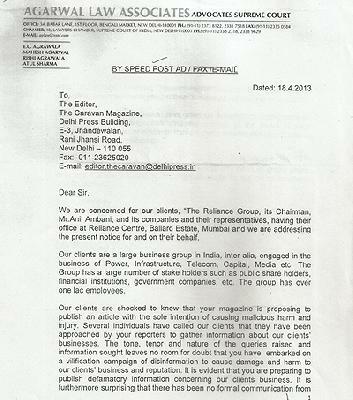 PARANJOY GUHA THAKURTA reports how a law firm served notices on the editor of Caravan magazine even as it was working on a cover story on the attorney general. Pix: The notice sent. Question: What is the nature of the relationship between one of India's richest men and the country's top legal officer? Question: Can legal notices be deployed to prevent a publication from coming out with an article even before it is published? Answer: Such attempts are indeed made but these are not always successful, since not all editors and publishers are easily intimidated or buckle under pressure. Question: Are the above two questions related? Question: Who is among the richest men in India?